Malaysia has stepped up diplomatic measures against North Korea in an escalating row over the killing of Kim Jong-nam, the half-brother of North Korea's leader Kim Jong-un. Kim Jong-nam died in mysterious circumstances last week at an airport in the Malaysian capital Kuala Lumpur. Police believe he was poisoned. Malaysia has recalled its ambassador from the North Korean capital Pyongyang and has summoned the North Korean ambassador "to seek an explanation". Malaysian police say they are now looking for four North Koreans. North Korea's ambassador to Kuala Lumpur, Kang Chol, told reporters that he did not trust the Malaysian inquiry. "It has been seven days since the incident but there is no clear evidence on the cause of the death and at the moment we cannot trust the investigation by the Malaysian police even though its results [have yet to be] obtained. "It only increases the doubt that there is someone else's hand behind the investigation." He said that the incident had been "politicised" and referred to the victim as Kim Chol - the alias used by the dead man. Malaysia responded that the North Korean diplomat's allegations were based on "delusions, lies and half-truths". In a statement, Foreign Minister Anifah Aman said that any suggestion police were not conducting an independent or impartial investigation was "deeply insulting to Malaysia"
Malaysia's prime minister earlier defended the country's police, saying he expected North Korea "to understand that we apply the rule of law in Malaysia". Meanwhile a video which apparently shows CCTV footage of the attack on Kim Jong-nam has surfaced and aired on Japanese television. What has led to the diplomatic spat? Malaysia was one of very few countries which had relatively friendly relations with North Korea. Reports say it was the first country to enjoy visa-free travel to the isolated nation. But this killing has strained ties. Malaysia has refused to accede to North Korean demands to release Kim's body into their custody without an autopsy. In comments on Friday, Mr Kang, the North Korean ambassador, said Malaysia was colluding with "hostile forces". Malaysia's foreign ministry said his accusation was "baseless", adding that it was their responsibility to conduct an investigation as Kim had died on Malaysian soil. What's happening to Kim's body? Malaysian authorities are now waiting for the results of its post mortem, which may come as early as Wednesday, the health minister said. Kang Chol said his country would reject the result as it was performed without the presence of its representatives. Malaysia also says it needs to conduct DNA testing first. Police are now seeking samples from family members. Kim is believed to have family living in Beijing and Macau. Kim is believed to have been attacked in the Kuala Lumpur airport departure hall on Monday by two women, using some form of chemical. 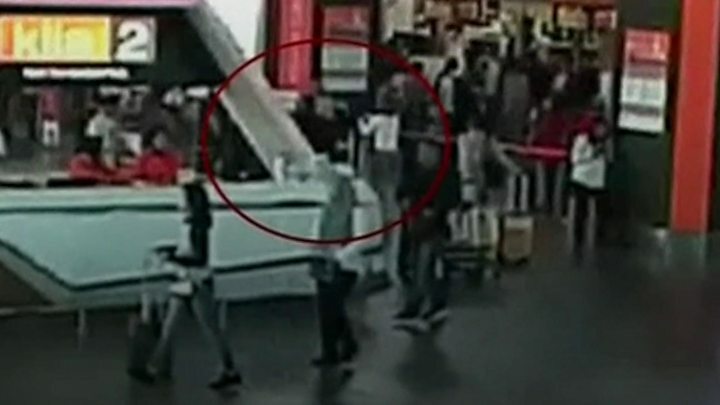 Fuji TV has aired grainy CCTV footage showing a man resembling Kim Jong-nam being approached by a woman at the airport. Another woman then quickly lunges from behind and wipes his face with a cloth. She is seen wearing a white top emblazoned with the letters "LOL". The men have been named as Ri Ji Hyon, 33; Hong Song Hac, 34; O Jong Gil, 55, and Ri Jae Nam, 57. Kim was the first-born son of former North Korean leader Kim Jong-il, who died in 2011. He was largely estranged from his family, after being passed over for the North Korean leadership in favour of his youngest half-brother. He went into exile in the early 2000s, spending most of his time in Macau, mainland China and Singapore. Kim had spoken out in the past against his family's dynastic control of North Korea. In a 2012 book he was quoted as saying he believed his younger half-brother lacked leadership qualities. But he had also said he was not interested in assuming the leadership himself.